The pair moved higher as dollar strengthened on fading trade war fears and signaling repeated failure to clearly break into daily cloud. Tuesday’s action is on track to leave the second consecutive daily candle with long tail and this time bullish, which signals rejection at strong support zone, provided by top of thick daily cloud and reinforced by rising 55SMA. On the other side, recovery struggles at psychological 110.00 barrier which proves to be strong resistance. The pair so far holds in the range identical to the previous day and looks for catalyst to emerge from current congestion and generate fresh direction signal. Daily techs show prevailing bearish tone as momentum remains negative and MA’s are in bearish configuration, which keeps the downside vulnerable., but directionless mode could extend while the price holds between current boundaries. 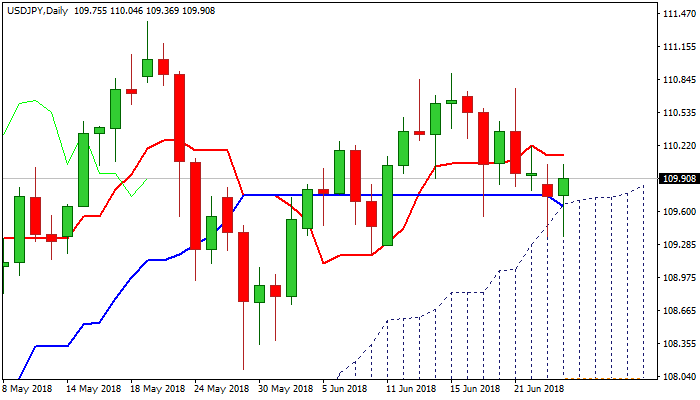 Bearish scenario requires penetration into daily cloud and clear break below 55SMA (109.39) to shift focus lower and expose key near-term support at 108.11 (29 May low). Conversely, sustained break above 110.00 would expose strong barrier at 110.20 (converged 200/10SMA’s) and signal further advance on break higher.